In general, people in the United States between the ages of 18 and 25 abuse drugs and alcohol at the highest rates of all other age demographics. 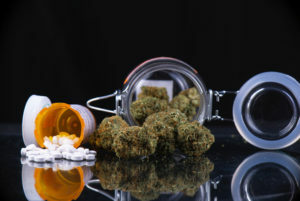 The National Institute on Drug Abuse (NIDA) publishes the National Survey on Drug Use and Health (NSDUH), which indicates that close to 75 percent of all Americans between the ages of 18 and 25 consumed alcohol in 2015, and close to 40 percent used illicit drugs. The average college student falls into this age range. There are many factors that can contribute to college drinking and drug use, such as peer pressure, being away from home with relaxed supervision for the first time, attempts to get ahead, and stress. Drug and alcohol use can quickly become problematic, however. Both alcohol and illicit drugs make changes in the brain that can be detrimental to young people, as brains are not fully developed until the mid-20s. Alterations in the reward, memory, and thinking, and learning pathways can cause long-term issues and difficulties, including substance abuse problems later in life. In Massachusetts in 2014, over 20 percent of public addiction treatment admissions to programs supported by the Department of Public Health’s (DPH) Bureau of Substance Addictive Services (BSAS) were for people between the ages of 18 and 25. This is also the age of people who most often need treatment services and do not receive them. The Massachusetts DPH publishes that unmet treatment needs for this demographic in Massachusetts continue to outpace national rates. Most college campuses have strict no-drug policies and closely regulated drinking policies. Many Massachusetts institutes of higher learning also have comprehensive prevention, treatment, and recovery programs and services to serve students. 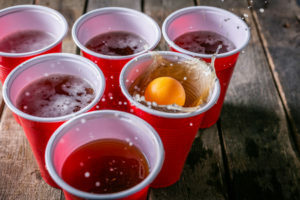 Drinking has traditionally been part of most college cultures, taking place at everything from frat parties to bonfires. Even though drinking isn’t technically legal for adults in the United States until age 21 and most college students are underage, this doesn’t seem to stop the beer and liquor from flowing. The National Institute on Alcohol Abuse and Alcoholism (NIAAA) publishes that around 60 percent of college students between the ages of 18 and 22 drank alcohol in the past month (based on a 2014 national survey) and two-thirds of them engaged in binge drinking. Binge drinking is a particularly dangerous pattern of alcohol consumption that involves raising a person’s BAC (blood alcohol concentration) to at least 0.08 g/dL in a span of two hours or less, usually meaning that a man consumes about five drinks or a woman consumes four drinks in that time period. One of the most prestigious universities in the country, Harvard University in Cambridge, Massachusetts, is no stranger to binge drinking and underage drinking. As published by the Harvard Crimson, the majority (70 percent) of incoming freshman do not claim to be drinkers; however, by the time they graduate, 77 percent say they choose to drink alcohol. Over half of all visits to University Health Services for alcohol-related issues are by freshmen as well, often due to inexperienced drinkers and risky patterns of alcohol consumption. Furthermore, in a survey of 2014 Harvard graduates, WCVB reports that 22 percent of students admitted to drinking more than twice per week, and 25 percent said they used marijuana more than once each semester. Over at the Massachusetts Institute for Technology (MIT), drinking rates are traditionally much lower than at other institutions. This could be due to the different culture at MIT. 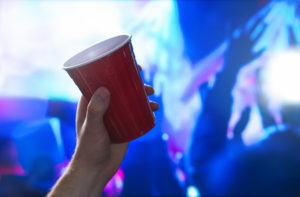 The MIT News credits the Screening and Brief Intervention (SBI) program that seeks to prevent binge and problematic drinking by recognizing potential issues and taking these students through the program, which includes counseling and education on the hazards of drinking. According to a 2003 survey, only one out every four MIT undergraduates reported binge drinking – a rate that is much lower than at other colleges throughout the state and country. Over at Boston College and Boston University, there is a known culture of rowdy parties, football games, and underage drinking. Boston University’s BU Today publishes alcohol enforcement statistics for weekends; for the weekend of November 17, 2016, there were nine medical alcohol transports, one response to a loud party, and two summons for alcohol violations. These statistics, of course, only involve students who got caught, which is quite likely only a fraction of those who actually engaged in problematic drinking. At the University of Massachusetts, U Matter at UMass publishes that 74 percent of students report past-month alcohol consumption. Nearly 40 percent of UMass students scored high (eight or more) on the screening tool for high-risk drinking (AUDIT, the Alcohol Use Disorders Test). College students are regularly looking for a way to try and get an edge in school. As a result, they may be tempted to misuse prescription stimulants, such as those prescribed to treat ADHD. These “study drugs,” as they are often called, may help a student to stay awake and focused for longer, enabling them to cram for an exam or finish a term paper. Studies suggest that as many as 30 percent of college students have misused a prescription medication. A study published by Massachusetts General Hospital warns that this is a particularly dangerous endeavor, as nearly 70 percent of Boston-area college students surveyed who abused these medications struggled with addiction involving stimulant drugs. Taking these drugs with alcohol can exacerbate the risks, increasing the odds for alcohol poisoning. Prescription medication misuse is often incorrectly deemed “safer” than the abuse of other drugs. The journal Healio Psychiatric Annals reports that nonmedical prescription opioid abuse skyrocketed nearly 350 percent from 1993 to 2005. Massachusetts residents suffer from extremely high rates of opioid misuse and abuse. 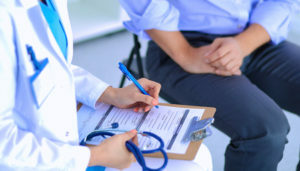 Prescription drug addiction can potentially lead individuals to turn to other more easily obtainable drugs, such as heroin and the potent man-made opioid fentanyl. The publication Inside Higher Ed reports that students struggling with heroin addiction are more likely to attend commuter colleges, returning home on the weekends to obtain more drugs. The Massachusetts opioid crisis is at epidemic levels with nearly 2,000 residents dying from a drug overdose in 2017, per the Massachusetts DPH. As such, many organizations throughout the state and on local college campuses have taken measures to address the problem in an attempt to minimize opioid abuse and overdose deaths. Bridgewater State University, for example, has made Narcan (naloxone) available to the general public on campus, placing the drug in 50 defibrillator boxes around campus and in all 11 residence halls; the Boston Globe reports this is the first program like this in the entire United States. Another common drug of abuse on college campuses is marijuana, which is recently legal for adult (ages 21 and older) recreational use in Massachusetts. Legalizing marijuana may make the drug more accessible and cause students to view it as less risky. Information published by Multi Briefs warns that making the drug legal can also lead to increased use on local college campuses. Studies involving Oregon State University (OSU) after Oregon legalized recreational marijuana use show a dramatic rise in undergraduate student marijuana use, Newsweek publishes. Regardless of the legality of marijuana in Massachusetts, Boston Magazine reports that it will still be considered illegal to use or possess marijuana on college campuses in the Commonwealth. The annual senior survey at Harvard for the Class of 2017 reported that 51 percent of students admitted to trying marijuana at least once, and 27.7 percent of the class of 2021 reported the same, the Crimson Tide publishes. The city of Cambridge has voted “yes” to allowing recreational pot shops to open, including one in Harvard Square. Marijuana is still illegal at the federal level, however. Because the university receives federal funding, the drug will still be banned on campus despite its local legality and accessibility. In Massachusetts, addiction treatment is localized, meaning it is offered by community-based sources, often through community health centers (CHCs) that are licensed and overseen by the Massachusetts DPH Bureau of Substance Addiction Services (BSAS). To find local treatment options, residents of the Commonwealth can use the confidential and free Massachusetts Substance Abuse Helpline, which can provide resources on treatment options, information on admittance, and referrals to care. The Behavioral Health Treatment Services Locator operated by the Substance Abuse and Mental Health Services Administration (SAMHSA) is another tool for finding state-regulated substance abuse and mental health providers based on a person’s local zip code. Many treatment providers offer specialized services for special populations, including adolescents and young adults. College students often have circumstances that require individualized treatment options. For instance, in order to keep up with class work, students may attend outpatient addiction treatment programs that can work around a student’s class schedule. College campuses also often have support services for addiction treatment and recovery support as well, including specialized sober housing and networking opportunities for students in recovery. University Health Services at UMass Boston: This organization offers consultations with a licensed drug or alcohol counselor who can answer questions related to problematic drug and/or alcohol use, the Brief Counseling for Alcohol and Other Drug (AOD) Concerns program, the 360 Proof program that allows students to confidentially and personally assess their alcohol use through an interactive web program, and the BASICS (Brief Alcohol Screening and Intervention for College Students) program, which is also a confidential service. Wheaton College Counseling Center: This center provides alcohol and drug counseling, mental health support, and crisis management services to students. The Office of AOD Services at Harvard University: This office works with others within the Department of Health Promotion and Education as well as other university partners to provide a wide range of prevention, treatment, and recovery support services on campus. University Health Services at UMass Amherst: This organization provides counseling, support, and tobacco cessation programs for students. Tufts University Counseling and Mental Health Services: This group offers confidential and complimentary mental health support from professionally trained counselors for students who have paid the health fee. University Counseling Services (UCS) Boston College: UCS supports students with a variety of behavioral health services and programs, including individual counseling and group therapy sessions. Boston University Student Health Services: This organization offers brief treatment options and referrals to more comprehensive and local addiction and/or mental health treatment programs for students. Another aspect of addiction treatment is prevention. Most college campuses have programs and services to help minimize alcohol and drug abuse. The University of Massachusetts Boston, as well as many other colleges and universities in Massachusetts, require all incoming students to take an alcohol and drug education class, such as AlcoholEdu and/or Haven, an online course pertaining to the safe use of alcohol and drug safety. Many also offer the CHOICES program, which is provided through one or two 90-minute classes designed to inform students on alcohol abuse and allow them to make their own personal decisions regarding alcohol consumption. Harvard University runs the DAPA (Drug and Alcohol Peer Advisors) program, which helps peers connect with mentors who can answer questions related to drug and alcohol use and provide education and information designed to minimize substance abuse. Campuses across the Commonwealth are often tobacco-free, and organizations such as Tobacco-Free UMass Amherst support students refraining from tobacco use. The Office of Prevention and Education (OPEN) at Northeastern University offers a nonjudgmental and supportive environment for students to check in to assess drinking and drug use behavior. It is open for all students who are seeking information on personal health and wellness. New England Students in Recovery (NESIR): NESIR provides a social media outlet, offering information and support for college students in recovery. New England Collegiate Recovery Network (CRN): CRN is offered through many campuses and colleges in Massachusetts. Sober Student Network: Offered through Boston University, this network supports students in recovery. Recovery Radio Network: This network provides workshops and 12-Step speakers that students can tune in to at any time in privacy. UMass Students for Recovery: This recognized student group hosts sober activities and offers ongoing support on campus and in the community. Young People in Recovery: With chapters all over the country, including in Dartmouth, Massachusetts, this organization supports the specific needs of this demographic in recovery. New England Region of Narcotics Anonymous (NERA): Specialized groups often meet on college campuses for students, providing peer support through a 12-Step program for sobriety. Alcoholics Anonymous (AA): AA also provides 12-Step programming for those who remain abstinent from alcohol during recovery. Boston College Recovery and Sobriety Support: This group offers many resources, including recovery housing and extensive support services. Virtually every college campus will have some form of addiction prevention, treatment, and/or recovery support options open to current students. To find out more information on specific programs at a certain school, students should check with their student support, students services, or university health center for more information. 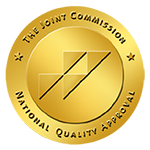 These services are generally brief and often intended as a first intervention before entering into a more complete addiction treatment program when needed. Local treatment programs regularly have specialized services and programming that can cater to the student and young adult population as well.